Learn how adding a human element to your inbound marketing strategy drives conversions and generates growth for your company. As the functionality and efficiency of marketing automation continues to progress, more and more marketers are making these software platforms a core element of their marketing strategy. While marketing automation is a great tool, its adoption can sometimes distance marketers from their customers. Why is this a problem? Because at the end of the day, humans don’t buy things from automated messages. We buy things from other humans. Conversational Marketing is a new marketing approach that has gained a lot of traction in the worlds of B2B and SaaS marketing. This highly effective strategy provides a new way for marketers to incorporate one of the most traditional and essential marketing concepts: human interaction. This guide will introduce you to the key elements of Conversational Marketing and how you can leverage this strategy to further align your marketing and sales teams to promote growth for your company. Conversational marketing is a one-to-one approach that allows marketers to connect with their website visitors in real time. Unlike traditional marketing strategies that use forms for lead generation, conversational marketing uses intelligent chatbots and immediate, personalized messaging to capture qualifying information about website visitors. You might be wondering what this looks like in action. Have you ever gone to a website where a box in the corner pops up saying, “Hello, my name is _______. Can I help you find anything today?” If so, you have witnessed conversational marketing — and my guess is, you might not have even realized you were being marketed to at the time. That’s the great thing about conversational marketing: It’s discrete. Consumers want to purchase from marketers who genuinely try to help them solve their problems, not marketers who basically wear a “BUY MY PRODUCT” sign across their foreheads. Aside from enabling a more frictionless funnel for marketing and sales teams, conversational marketing plays a huge role in humanizing the customer experience — a concept many marketers have become detached from. Somewhere in our quest to excel as marketers, we have become hyper-focused on data and automation. There is no doubt that the analytical side of marketing and revenue generation are important, but the key to being a successful marketer is never losing sight of the importance of human interaction. The goal of refocusing on this connection is not to forego analytics altogether, but instead to strike the balance between the human and data-driven elements of marketing. This idea is at the core of every strong conversational marketing strategy. Now that you have a better understanding of what conversational marketing is and why it’s important, you might be left wondering how exactly it works. Again, conversational marketing leverages chatbots as a messaging platform to converse with visitors in real time, enabling quicker and more efficient engagement. Chatbots are at the core of any successful conversational marketing strategy and are designed to emulate actual human conversations. With chatbots, marketers can create message sequences that use if/then branches to lead visitors through a conversation. The bot will ask different questions and follow a different conversation path depending on how each individual visitor responds to each question. This logic allows the visitor to “choose their own adventure” in navigating your website — and allows the marketer to segment their visitors based on fit and interest. 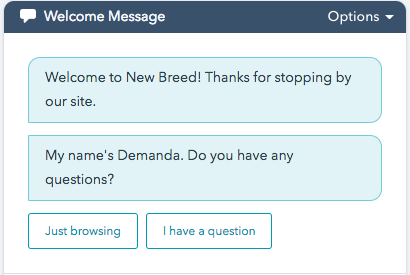 Here is an example of our chatbot at New Breed to give you a better idea of what it looks like to set one up. As you can see from the if/then branch, the bot will respond differently depending on the answer that the visitor selects. Did you know that the average email open rate is only 20%? Or that the average landing page conversion rate is only 2.35%? What do these metrics mean and why are they relevant? These statistics are verification that the typical, run-of-the-mill marketing strategies are not resonating very well with consumers, and because of this, marketers are losing their interest. This is why conversational marketing has such a drastic impact on outreach methods: customers want to have real, genuine conversations with the people they are considering purchasing a product from — especially when that product has a high price tag. A recent study by Twilio found that 90% of consumers would tell you they prefer messaging with businesses to any other form of communication. 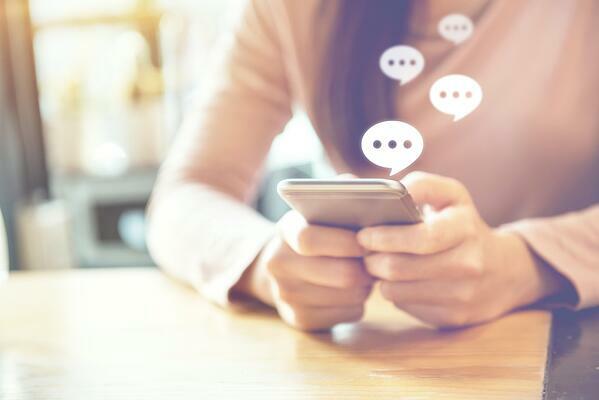 This demonstrates what we already know: The ability to communicate with your consumers, answer their questions, and help alleviate their concerns from the moment they reach your website is what makes conversational marketing such a powerful tactic. 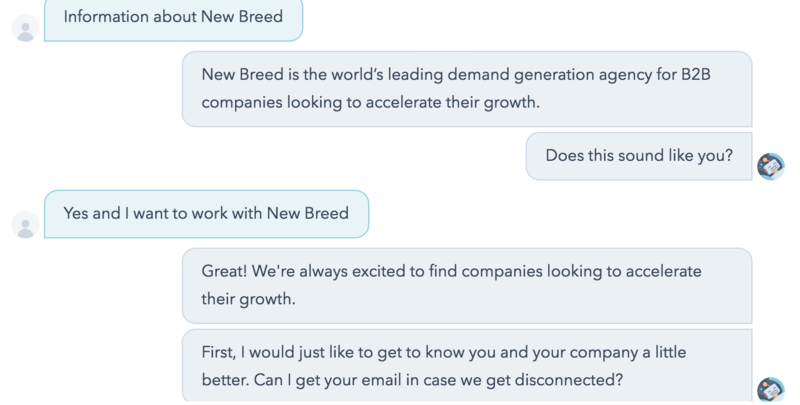 If you’re looking for confirmation that a conversational marketing strategy will benefit your company, the New Breed team can attest to its abilities. We incorporated conversational marketing into our inbound strategy back in May, and already we have witnessed our lead-to-opportunity conversion rate jump from 2.8% to 5.2%. This means our chatbot has been 85.7 % more effective in turning our leads into opportunities for us. Here is an example of one of our chatbot conversations and how they go about transitioning our leads into opportunities. Conversational marketing has significantly improved our marketing and sales strategy, and it can do the same for your company. Now that you have a better understanding of how it works, let’s take a look at some of the reasons it can be an asset to your company. Implementing a conversational marketing strategy provides context and insight about your website visitors. One of the most important things to understand about your visitors is why they come to their website in the first place. This can be difficult information to gather from a gated form. Fortunately, this is where a chatbot comes in handy. Chatbots are highly personalized and allow marketers to ask more in-depth questions about their visitors than they would on any form. Visitors are more likely to reveal the answers marketers are looking for through conversation. While chatbots and traditional forms both have form fields, there is a greater opportunity to organically gain in-depth information from your visitors through the use of a chatbot. Collecting this data over time will help you better understand your customer base and make it easier for you to identify gaps in your marketing strategy. Personalized and scalable are not two words you hear most marketers use in tandem. Think about sending a mass email for example. It would be difficult to send an email to 500+ people while making sure each one was personalized for each specific contact. The creation of personalization tokens has helped minimize this problem, but even with those, it is still difficult for marketers to send a genuine, authentic-sounding mass email. Conversational marketing helps break this barrier between customization and scale. 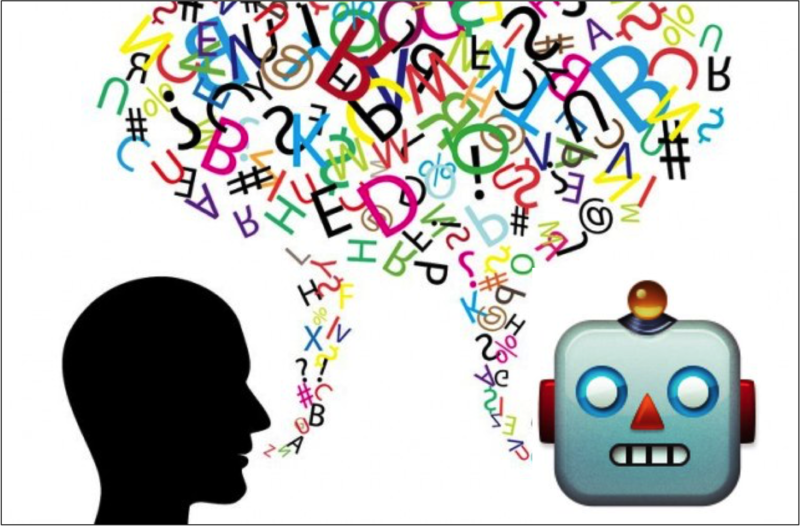 Each conversation a chatbot engages in is dependent on each unique visitors' response, creating a customized experience. Many marketers and salespeople will tell you their biggest problem is not having the means to scale their strategies. There was a time when in order to reach out to hundreds of leads, you would need to have hundreds of employees on the phone reaching out to them. Chatbots can handle multiple conversations at once, allowing marketing and sales teams to expand their reach. Chatbots simulate the role of an automated Business Development Representative (BDR) for your business. Through a series of questions, bots are capable of replacing the lead qualification responsibility of BDRs, saving sales teams a tremendous amount of time. The chatbot’s reduction of unqualified MQLs results in a smaller, more qualified list of SQLs for salespeople to work with. Chatbots reverse the role of conversation initiation: instead of salespeople initiating the conversation with leads, the leads are reaching out to the sales team. Interested prospects can even schedule time on a salesperson’s calendar, reducing monotonous tasks for salespeople. Not only do chatbots qualify good fit leads for your sales team, but they also help salespeople identify any unqualified leads. Because the end goal of all marketing and sales efforts is generating revenue for the company, identifying those people who will likely never buy your product is a huge advantage. This enables salespeople to spend their time and effort on the leads who are actually likely to purchase their product or service offering. In addition to creating efficiency, conversational marketing results in shorter sales cycles by enabling the sales team to get in touch with highly qualified leads more quickly. Salespeople no longer have to wait for their leads to fill out a form before they get in contact with them. Chatbots enable website visitors to schedule meetings with sales teams on the spot by providing a link to a salesperson’s calendar. Salespeople are then notified by their bot that there is a visitor ready to speak with them drastically cutting down the sales cycle. By reducing the time it takes to convert a lead into a closed customer, you will save more time to generate new opportunities and grow your pipeline. And because your leads are hyper-qualified, they will be more likely to purchase your product, leading to a higher opportunity-to-customer conversion rate. The marketing-to-sales handoff has never been easier. Chatbots create an effortless transition of qualified leads from marketing to sales. Once a visitor establishes they are ready to speak to the sales team, the bot automatically notifies a salesperson. 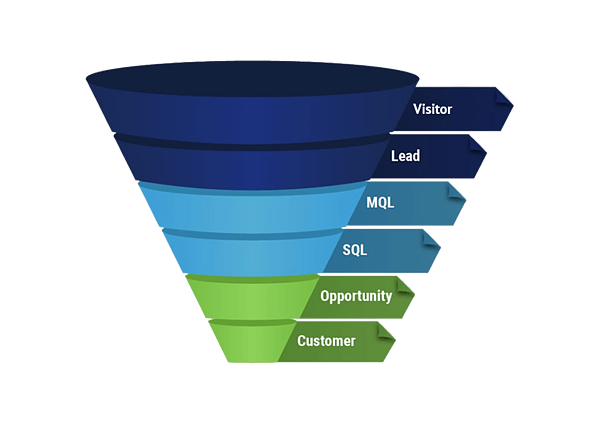 Top-of-the-funnel leads have a better chance of becoming customers. With advanced insights into your visitors' challenges, marketers can better guide prospects down the funnel. These insights also provides salespeople a better understanding of possible concerns, allowing them to prepare for objections during the sales process. Messaging will remain consistent for the entirety of the funnel. Because your salespeople can access all your chatbot’s conversations, they can ensure their messaging is consistent with previous engagements. Utilizing conversational marketing tools to improve your marketing and sales unification is key to improving business processes and driving future growth for your business. The first step in the conversational marketing methodology is capturing information from your website visitors. Marketers spend an immense amount of time and effort on initiatives like SEO, paid search and social media to drive people to their website. But once they generate the traffic and send their website visitors where they are looking to go, marketers run the risk of their visitor not filling out the form when they get there. Chatbots reduce this risk because they help guide someone towards the content they are looking for while capturing their information along the way. Conversational marketing replaces traditional lead-capture forms with instant messaging to induce better engagement, a deeper level of interaction and an overall greater understanding of the website visitor. As an added perk, bots work around the clock when you are offline and filter out the noise of low-priority visitors. 1. What is driving people to your website? 2. What types of challenges are your website visitors facing? 3. What types of products/service offerings are your website visitors most interested in? Finding the answers to these types of questions will better enable you to discover what types of contacts would benefit from speaking with your sales team. 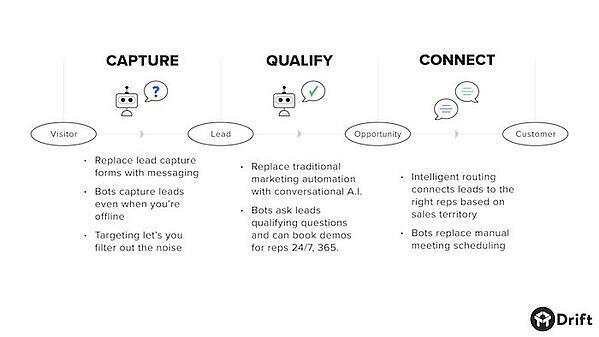 You’ve made it to the final step in the conversational marketing process: the connect phase. Now that your chatbot has established a qualified lead who is ready to talk to sales, they will automatically route that prospect to the appropriate salesperson based on sales territory or on a rotating basis. Most salespeople know that some leads are harder to initiate conversation with than others. If you’re trying to connect with a lead who needs a little push to come back to your website, you can send an email including a link that triggers a live conversation. If the sales representative reaching out is available to talk, they can qualify the lead right then and there. But if they are unavailable, there is no need to worry — your chatbot will continue the conversation for you. They’ll even provide your lead with a link to your calendar to go in and schedule a demo or meeting. Can I help you find something you are looking for? By allowing your customer to guide the path of conversation, you discretely open up the door for them to tell you the information you are looking for. If you are new to the concept of conversational marketing, you want to make sure you are using your chatbot(s) strategically. You don’t want to go testing out your bots on your most important website pages (example: your highest converting PCO) right off the bat. Instead, start off placing your chatbot on a page that gains less traction and learn how your bot interacts with the people who go to that page. By strategically placing your chatbot, you won’t risk damaging your website presence if your bot is not performing well. This tactic gives you time to analyze the gaps in your conversational strategy and make improvements before transitioning your bot over to your more high-impact pages. Though conversational marketing tools are great to leverage in your lead generation strategy, they shouldn’t be your whole lead generation strategy. Forms, specifically bottom-of-the-funnel forms, still provide valuable information and can be leveraged in unison with your chatbot. Some people may not feel as comfortable interacting with and giving their information to a bot as they do filling out a form. The best way you can start the implementation process is by replacing your top-of-the-funnel forms with chatbots to see if this is a more effective channel of communication with the people who are coming to your website. After you establish that your chatbot provides more substantial results than your forms, you can start transitioning your chatbots to your higher-impact website pages. When developing your long-term conversational marketing strategy, your goal should be to have chatbots on your highest converting website pages, but that is not where you want to start. Like any great strategy, the best approach is to focus on a steady progression that allows you to analyze the gaps and build on the successes. Chatbots present the perfect opportunity for smaller marketing and sales team to scale their conversations with website visitors. They allow you to spark conversations with more people, even if you have a limited amount of sales representatives. And while they are beneficial for finding out information about your potential customers, they are also beneficial for finding out information about your company. What questions are we not answering for our visitors? Does the website structure prevent our visitors from finding what they are looking for? What information are our customers really looking for? How can we make it easier for our customers to find this information? Finding the answers to these types of questions will lead to a better customer experience, higher conversion rates and greater customer acquisition. When considering your lead qualification strategy, most marketers can agree quality is more important than quantity. It’s more beneficial for marketers to send their sales teams a few, highly qualified leads than an abundance of unqualified leads. Doing so reduces the amount of time sales spends educating leads on why their product would be an asset to their company when they have no purchase intent. As a marketer, your goal for lead qualification should be to narrow your target audience and focus your efforts on your buyer personas. At New Breed, we have discovered that the most valuable way to find companies aligning with our buyer personas is by looking at the firmographics. In the B2B world, key identifiers like company size, industry and annual revenue play a significant role in segmenting your audience. Not every single one of your website visitors is going to be at the same location in their buyer’s journey. Some may be actively searching for solutions while others may have just come to the realization that they have a problem. Marketers must make it a priority to recognize lifecycle stages because the content that prospects engage with is different at each stage. If your prospect is at the top of the funnel (think leads and MQLs), they probably want to engage with high-level content like blog posts or ebooks. If your prospect is at the bottom of the funnel (opportunities), they probably want more specific, concrete content like case studies or consultations. Keep this in mind when creating your conversational marketing strategy. For example, if your website visitor mentions that they recently developed an interest in demand generation and are looking to learn more about it, your chatbot should provide a piece of content that aligns with the awareness stage, such as a blog post explaining demand generation and how to leverage it. If your customer comes to your website ready to make a purchase, having your chatbot schedule a demo with one of your sales representatives would be a more appropriate approach. What are you trying to learn about your website visitors? What types of leads do you want your bot to identify? What action do you want your visitor to take after they interact with your bot? Once you answer these questions for your company, you will be in a better position to decide what types of questions will provide you with the information you are looking for. While we encourage you to consider taking a more customer-driven marketing approach, we're by no means saying you should abandon the data-driven approach. Tracking the performance of your chatbot is one of the most important aspects of creating a successful long-term conversational strategy. We suggest analyzing the KPIs that closely align with the goal of your chatbot. At New Breed, our goal for our chatbot was to convert more qualified leads into opportunities. In this case, the most important KPI we chose to track was our lead-to-opportunity conversion rate. By establishing goals, tracking your KPIs and optimizing your strategy based on your data, you can create a conversational strategy that will produce substantial results. Your chatbot is one of the best indicators of your overall website performance. It creates an opportunity for you to learn what people are looking for and then execute on those findings. If you realize your chatbot is not providing you with the desired insights about your product, website or target audience, then it’s time to go back to the drawing board to figure out how your bot can engage in more meaningful conversations. After you have created, tracked and optimized your chatbot to be an efficient, revenue-generating tool, you can begin to scale your conversational strategy. Leverage more bots, put bots on high-intent website pages, create different bots for different lifecycle stages or even leverage your bots through different channels. At this point, you’ve discovered what works for you and what your customers are looking for, and you are in a position to start experimenting with higher-impact opportunities. But one key piece of advice before you start putting chatbots on all of your website pages: Scale gradually. Implementing a conversational marketing strategy is not an overnight process — it takes time. It is going to take a while to track your progress and maximize the potential of your chatbot. You want to ensure that your chatbot is doing exactly what you intended for it to do before you begin to expand it across different channels, webpages and customer lifecycle stages. Drift is a clear standout in the world of conversational marketing. It is the first and only platform dedicated only to conversational marketing. Their platform enables hyper-growth for companies who opt to leverage conversational marketing as part of their marketing strategies. While we consider Drift to be the top option for a conversational marketing platform, it is for the people who want to fully invest in the idea of conversational marketing. If you’re not sold on doing that, we have some other suggestions that will provide a less daunting transition for you. 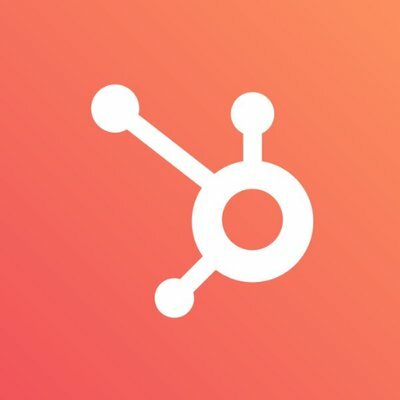 We couldn’t not include HubSpot on our list. Their new conversational marketing tool provides simplicity for marketers who are new to the idea and want to test the waters before creating a full-blown conversational strategy. In addition, the HubSpot platform is a one-stop-shop for all your marketing, sales and service needs, meaning your conversational marketing tool will seamlessly integrate with other areas of your marketing and sales operations. Conversica is another great option. It is the only automated software solution that can contact, engage, nurture, qualify and follow up with leads without the need for human interaction. However, this is both good and bad. It is an excellent choice for those marketing and sales teams that are spread thin or those who have a simple sales process where a customer might not need to work with a salesperson. But when leveraging a tool that has the ability to guide prospects through the entire funnel without any actual human interaction, you risk losing the human aspect of marketing that customers crave. 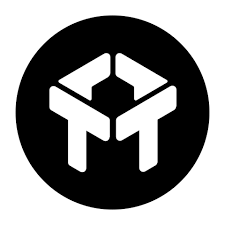 Intercom is a company our other suggestions on this list should watch out for. They recently introduced a chatbot named Answer Bot. Answer Bot takes conversational marketing to a whole new level. 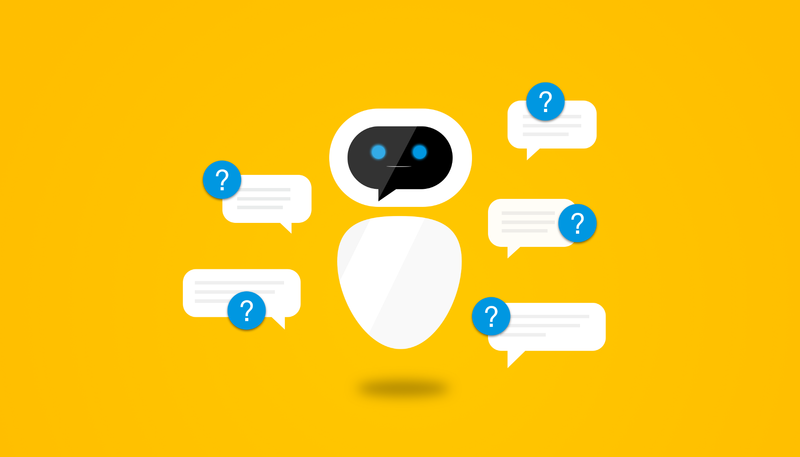 Unlike other conversational marketing tools, Answer Bot alleviates the technical challenge of visitors asking the same questions in a number of different ways. The bot is trained to recognize questions, and then provide customized answers to each specific question it is asked. Answer Bot even connects to applications, allowing companies to automate the entire customer experience. Like Conversica, this platform is ideal for companies who have a simple product (example: functions of product are easily understood and prices are set) that prospects feel comfortable purchasing without speaking with a salesperson. But leveraging this platform might not be the best option for companies who have a more complex product that requires consultation from the sales team. Because of their positive impact on efficiency, scalability and engagement, conversational marketing tools act as great enhancements to your overall marketing strategy. Chatbots bring a human element to marketing that other marketing automation softwares cannot replicate. But it is important to remember that adding a human element throughout the buyer’s journey is necessary when closing deals. By leveraging artificial intelligence in a way that humanizes the customer experience, marketers and salespeople can create an operational strategy that will provide lucrative results for their company. Lastly, you will need to ensure you have the support of both your marketing and sales team. Conversational marketing helps better align marketing and sales efforts, but it can only be done when everyone on both teams is on the same page. If you keep these thoughts in mind when executing your conversational marketing strategy, you’ll be closing more customers and driving far greater revenue and growth for your company than you’ve ever imagined.